Richard Adam Adubato was born November 23, 1937 in Irvington. A solid all-around athlete, he was a standout in basketball and baseball, and also played football. Richie attended William Paterson College, where he captained the basketball team and played first base as a senior for the school’s NAIA champion baseball squad. He graduated with a degree in administration, which helped him land high school coaching jobs. During that time he also held odd jobs to make ends meet, including bartending. During the 1960s and 1970s, Richie coached several high school and small college teams in New Jersey. Among his players were Mike Fratello and Brian Hill. Years later, he would serve on their staffs when they became NBA coaches. Richie got his first head coaching job in the NBA in 1979 with the Detroit Pistons. 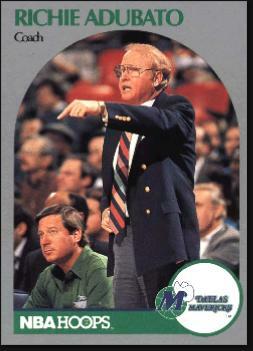 He also coached the Mavericks and Magic, and served as an assistant with the Knicks and Cavs. Richie scouted for the Hawks and also worked for the Celtics in an NBA career that spanned two decades. During his various stints on the sidelines he became know for his sometimes-garish wardrobe. In 1999, Richie was hired to coach the WNBA’s New York Liberty and guided them to the league finals three times in four seasons. After coaching the Washington Mystics from 2005 to early 2007, he returned to the NBA as a broadcaster for the Magic. Richie’s son, Scott, also became a basketball coach.